The fully developed claim (FDC) is an option presented by the Department of Veterans Affairs (VA) as a way to have your claim processed more quickly. The idea is if you submit all evidence up front, the VA does not have to “develop” the claim by requesting additional records or information. The FDC program is an optional new initiative that offers veterans and survivors faster decisions from VA on compensation, pension, and survivor benefit claims. To accomplish this, the VA uses its series of “EZ” forms and are most notably used in compensation (Form 21-526EZ), pension (Form 21-527EZ), and Dependency and Indemnity Compensation (Form 21-534EZ). Using the EZ forms, the FDC process works this way: Veterans and survivors submit all relevant records using the EZ claim form, including private (non-VA) medical records. On the form, you certify that you have no further evidence to submit. In some cases, the VA may send a development letter to the Veteran asking for specific information.If ONLY the requested information is returned, the VA will not automatically exclude the claim. Any additional information or documents not specifically requested will cause the claim to be relegated to the standard process. Failure to participate in any development effort can lead to a denial of your claim, so don’t ignore any VA request for information and pay close attention to the time limit you are given to respond. A Veteran Service Officer (VSO) can be your advocate throughout the VA claims process. VSOs can be a sounding board and a second set of eyes. A VSO can review information and ask relevant questions. Choose a VSO that is knowledgeable about eligibility rules, forms completion, required and recommended “proof documents”; telling your story in the most complete and efficient way in the strongest claim packet that can be submitted. Representation is not for everyone.VetsHQ offers information and resources to assist the Veteran in filing the strongest disability compensation claim possible.Visit www.vetshq.com often for the latest updates and relevant information. B. If available, use a Disability Benefits Questionnaire (DBQ) that matches the condition or disability you are filing a claim for. It can be completed by a private or VA medical provider. There are only about 70 DBQs developed so far, so don’t worry if there isn’t a DBQ to match your condition or disability. You can look at any DBQ form to see what types of information the VA is expecting – then make sure your medical records contain the same kind of information about your specific condition(s). C. Answer all the questions on the form. Don’t leave any boxes blank of your claim form. Instead, consider using N/A (not applicable) or ‘None’ unless the form instructions specifically state to use other words. That will let the VA know you didn’t forget something. D. Write a letter to tell your story to the VA. Your medical records and the claim form document give specific information like name or diagnosis code – a personal letter can share how your condition or disability has affected your life – it’s what we call ‘the rest of the story’. If they have first-hand knowledge through observation, your friends and family can also contribute a statement with details about the injury, event, or disease and how it has affected your activities, relationships, etc. E. Submit all private (non-VA) medical records relevant to your disability claim. F. If your condition or disability is related to service in the National Guard or Reserves – submit a copy of all medical and personnel records maintained at your unit. (Note: your unit records may be in a separate location such as a medical flight office or a personnel section). In the FDC process, the VA will not ask for them. G. Don’t submit duplicate evidence — the VA will put your claim back into the initial development phase because additional documents have arrived. They don’t know the records are a duplicate until after a thorough review of your claims file. Ask your Veteran Service Officer for assistance if you get a letter from the VA that you don’t understand. The VA might be required by regulation or law to send out letters. There has been some discussion, but no proof of time saved by filing online instead of submitting a paper claim packet to the VA. Here is what you should know if you choose to file your claim online using the VA’s eBenefits tool: There is a fundamental difference between saving and submitting your documents on the platform. Once you upload documents and click “save,” you will have one year to complete the FDC process. Once all of your documents are uploaded and you believe your claim is as strong as it can be, click “submit”. Once you “submit”, you are telling the VA that you have verified that you have no more evidence. 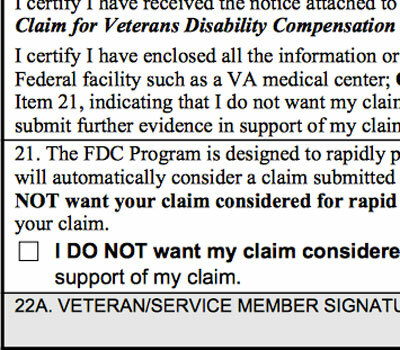 If you submit additional evidence or proof documents after that point, or a release of information form for the VA, your claim will be taken out of the FDC process and will be processed in the regular claims channels — lengthening the time it will take for you to receive a reply to your claim submission.